The O’Mally sisters love mud! They make mud cookies, mud pies, and mud castle. “Tubtime!” their mother shouts when they come in from playing. One day, something extraordinary happens. The girls take three bubble pipes into the tub and discover that they can blow bubbles filled with squawking chickens, jumping frogs, and one hungry, teeth-chomping alligator! The bathroom gets crowded, and the O’Mally girls start to worry that the hungry alligator will break his bubble and eat everyone up! 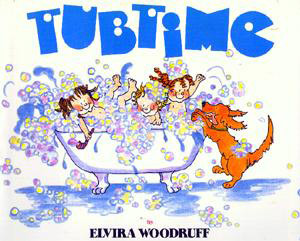 What happens when Dad discovers the bubble pipes ends this rollicking tubtime fantasy.